You remember the day that you bought Math Jokes 4 Mathy Folks. You headed directly home from the bookstore and read it cover to cover. Then, once the tears of laughter had dried, you read it again. And sure, you were a little concerned that if you read it a third time, well, you might be accused of neglecting your family. But social reputation be damned… you’re a mathy folk, and neglecting people is what we do. So you returned to the first page and gave it one more go. That day was several years ago. Today, MJ4MF occupies a position of honor on your bathroom shelf, and while conducting your business you occasionally open to a random page, hoping to rediscover an old chestnut. But alas, you’ve read it so many times, you have every joke memorized, and the cover is falling off. Head over to Amazon to order a copy today! Officially, it isn’t available until August 15, 2017 (bonus points if you know why that date was selected as the publication date), but you can get it now, and you’ll have plenty of time to memorize the jokes before the first day of school. So, what will you find in this new collection? Over 400 jokes, from every branch of mathematics. What is PA + PN + LA + LN? A (P + L)(A + N) that’s been FOILed. What happened in the binary race? And what won’t you find in this new collection? You won’t find a single one of the 400+ jokes that were in the original Math Jokes 4 Mathy Folks. That’s right, this collection is 100% entirely new! Don’t delay! Be the coolest kid on your block by ordering a copy of MORE Jokes 4 Mathy Folks today! Why is Today “Prime Day”? An online shopper placed four items in his cart. When he checked out, his credit card was charged $7.11. Shortly thereafter, a programmer realized there was an error in the code, and total price had been calculated by multiplying the prices of the four items. The customer service department was about to alert the customer to the error, but the programmer informed them that the total price would have still been $7.11 if the prices had been added. No harm, no foul. There was no sales tax. What was the cost of each item? * No, Amazon did not pay me to write a blog post about Prime Day. Hold On… How Many Copies? How many copies of Math Jokes 4 Mathy Folks do you think sold last week? Like the author (and readers) of this blog, you’re a math geek. You swoon at the sight of data. You’ve never met a puzzle you didn’t like. You want to show the world how awesome you are. You’d like to win a signed copy of Math Jokes 4 Mathy Folks, some cool MJ4MF stickers, and a surprise gift, all shipped to you in exclusive MJ4MF packaging! If you’re reading this blog, then you surely love being alive in the Age of Big Data. I love it, too, and I devour any data that I can get my hands on. Amazon feeds my desire by providing two valuable pieces of data about Math Jokes 4 Mathy Folks. First, they provide the sales rank for the book, which is updated hourly. Second, they provide weekly sales data. The downside to this latter stat is the delay in its release — they provide data for Monday-Sunday, but it isn’t released until the following Friday. The upside is that big dorks like me use the time from Monday through Thursday to make predictions. The chart below shows the average sales rank and weekly sales for Nov 24 through Dec 14. (The “average sales rank” is the average of the sales ranks for the seven days each week. Although it’s updated hourly, I don’t have the time to check it that frequently, so I rely on Author Central, which reports the sales rank at the end of each day.) It also shows the average sales rank (but not sales) for last week, Dec 15‑21. The question: How many copies of MJ4MF were sold last week? Oh, sure… I could just wait until Friday to find out — but what fun would that be? Holiday sales are most vigorous in the first two weeks of December. They slow down a bit in the third week. 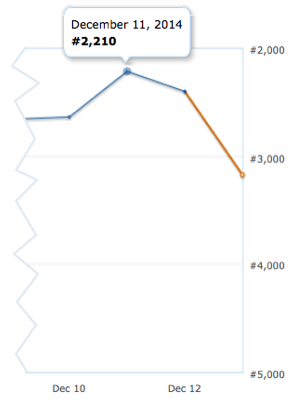 Consequently, a sales rank of 1,655 on Dec 1 does not equal a sales rank of 1,655 on Dec 21. The long-term trend is not linear. 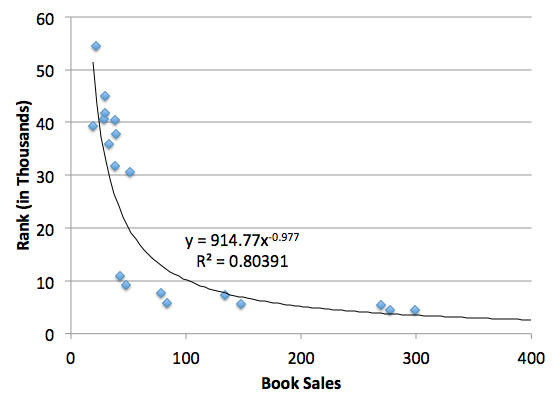 In fact, this graph from Foner Books shows that it’s logarithmic. Which brings us to the contest. Go to the Google form and enter your prediction and email address. (The email is only so I can contact you if you win.) Closest guess to the actual number of sales will win the grand prize. In the event of a tie, a winner will be randomly selected (or if I’m feeling generous, maybe there will be multiple winners… it’s hard to predict my disposition on any given day). So, what are you waiting for? Open Excel or SPSS or your stat software of choice, muddle through a few regressions, and submit your entry! Winners will be announced on Saturday, December 27, 2014. The exact time will depend on what time I roll out of bed, what activities my wife and kids propose for the day, and my particular disposition on Saturday. On second thought… safest if you check back on Sunday. Today is a great date, and I almost missed it! Today’s date (in U.S. format) is the last time this century that the month, date, and year are consecutive numbers. If you choose not to celebrate this momentous occasion, you’ll have to wait almost 89 years for this to happen again. Another great date with consecutive numbers happened 5 years ago. That’s the date that Math Jokes 4 Mathy Folks was published. And I rather like 12/11/14. That’s just two days ago, when Math Jokes 4 Mathy Folks reached a rank of 2,210 on Amazon. That’s the highest sales rank it’s ever received. Woo-hoo! Every year around this time, there is a significant spike in sales of MJ4MF. Ostensibly, it’s a good gift to give your engineer husband, statistician wife, or geometry teacher. And I am ecstatic that so many people are enjoying the book. But I’m wondering if we can blow the roof off of the Amazon rank; with a concerted effort, can we get the ranking of MJ4MF to below 1,000? Ordering by Tuesday, December 16 will still allow the book to arrive in time for Christmas or the last night of Chanukah, especially if you have Amazon Prime. Since Amazon sales rank is based on a 24-hour period, any purchase on Tuesday will help with the ranking, so we don’t need to be much more specific than that. And if you’re not thinking of buying Math Jokes 4 Mathy Folks this holiday season, well, what the hell is wrong with you? All the cool people are doing it. To fully understand this review, I offer the following annotations. Sadly, this last claim is mostly true. But my grandmother’s pierogi were divine, and the recipe is worth far more than $50. Kindly submit your bid in the Comments. This morning I gave this book to my son, he didn’t put it down for a long time. He was laughing and flipping the pages as fast as he could. And he was on his summer break! She is wise beyond her years, and I appreciate that she took the time to share her insightful comments with the world.